Is Anything Left of SmartTrack? 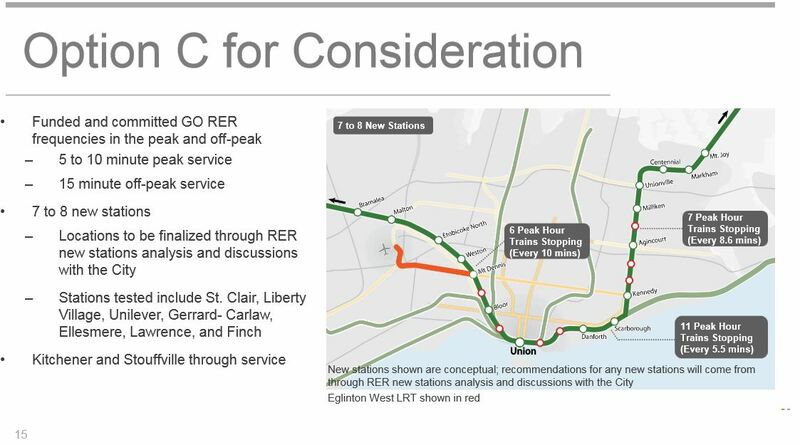 In the City Planning report at Executive Committee on March 9, 2016, two options for the configuration of a “combined” SmartTrack and GO Transit/Regional Express Rail (RER) service remain on the table. These are referred to as Option C and Option D.
The number of trains/hour cited here has bothered me for some time, and a recent conversation with Jonathan Goldsbie of NOW Magazine got me digging a bit deeper. 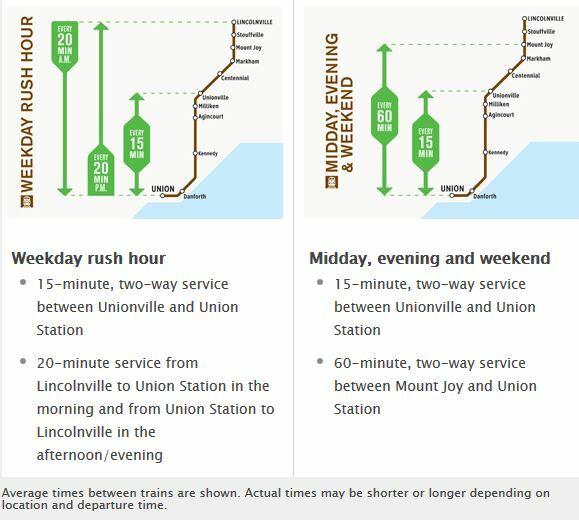 Here is the service plan for the Stouffville and Kitchener corridors as shown on the Metrolinx RER website, in the “How Will I Benefit” page. 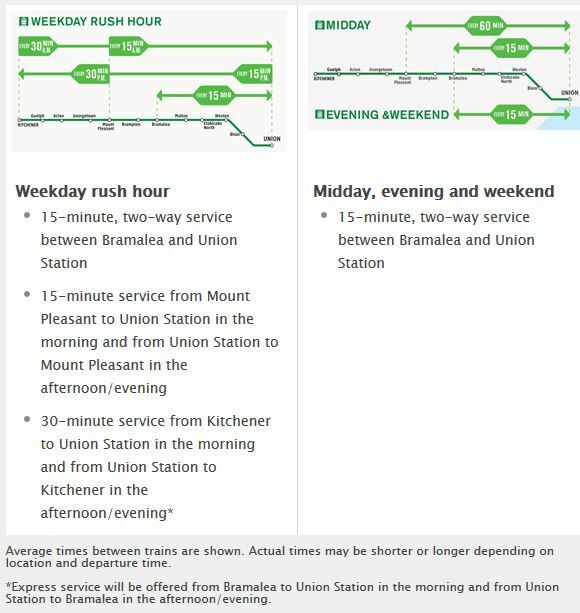 Peak service on the Stouffville corridor totals 7 trains/hour or one every 8.6 minutes as shown in Options C and D.
In the Kitchener corridor, there are 8 trains/hour, but two of these are service to Kitchener which would run express from Bramalea to Union leaving only 6 “local” trains in that segment. The service levels and station plans have profound implications for the transit network now under study. There is no distinct SmartTrack service, only GO trains and (maybe) a few new stations. There will be no “SmartTrack” branded fleet. If TTC fares will be offered on SmartTrack, this will really consist of giving people cheaper rides on service GO is already operating. If “Regional Fare Integration” means that TTC rapid transit (subway) fares rise and GO fares for short trips come down, then SmartTrack will be a cash grab from subway riders to cross-subsidize SmartTrack riders on GO trains. Demand models for SmartTrack indicate that very frequent service at TTC fares is required to attract substantial ridership, with 12 trains/hour (one every 5′) performing best in the model runs. The proposed service is considerably less frequent. “TTC fares” implies full transfer rights at no premium to and from the TTC network. The existence of frequent SmartTrack service and stations in Scarborough is an integral part of the plan to build the subway extension as a one-stop express route to the Town Centre. Part of the justification for keeping the Relief Line alignment to the north along Queen Street rather than King is to avoid competition with SmartTrack. However, there won’t be any SmartTrack service for it to compete with, only GO trains. Tax Increment Financing requires that SmartTrack contribute something to the uplift in property values that would not occur absent the new service. However, the “new” service will entirely be GO Transit’s, and it will occur whether anything called SmartTrack exists or not. The obvious question here is “where is SmartTrack”? 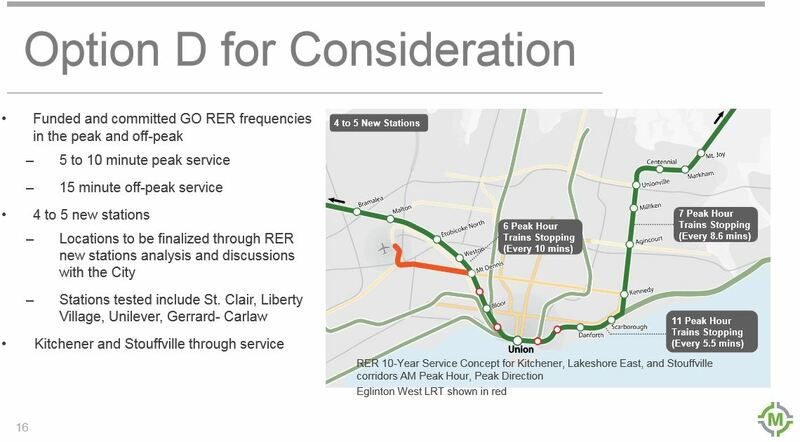 In fact, it has completely vanished from the map, and at best would be represented by a handful of new stations, none of which is in Scarborough in Option D.
Is this the master plan, the culmination of John Tory’s election campaign and all of the vitriol poured over his critics?